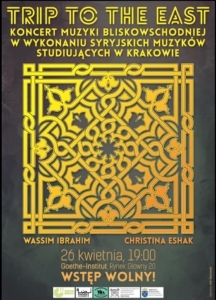 The Nahda Foundation, Welcome to Krakow Initiative, and the Goethe Institute in Krakow, Institute of Sociology of Jagiellonian University had a pleasure to invite you to the concert of Christina Eshak and Wassim Ibrahim, Syrian musicians studying in the city. The concert took place on April 26th, 2016 at Goethe Institute in Krakow. During the concert they took us on a musical journey through Syria, Lebanon, Jordan, Egypt to finally reach the distant Andalusia. They transported us to the oldest places on Earth, showing the richness of Arab sounds and the diversity of the Middle Eastern culture. “Trip to the East” was not only an opportunity to explore the extraordinary musical tradition of the Middle East. It was also an occasion to meet Syrian artists who after fleeing the war chose Krakow as their place of residence. Christina Eshak comes from Tartus located on the Mediterranean shore and Wassim Ibrahim is from Damascus. Before leaving Syria they were members of the Syrian National Orchestra. Wassim worked as a teacher of solfeggio, Christina appeared in the first opera ever staged in the Syrian capital. At 2013 they entered the Academy of Music in Krakow. Wassim Ibrahim – PhD candidate at the Academy of Music in Krakow in the Department of Composition. His compositions were played in Vienna, New York, Krakow and Warsaw. He arranged music for orchestras in Syria and Jordan. Member of the Choir of the Syrian National Orchestra, The Syrian Chamber of the High Institute of Music and the Rainbow Choir, with which he has often performed in Syria and abroad. Since 2008 a teacher of solfeggio (reading the musical notation with the voice). In Syria, he was training children, including hearing-impaired and autistic youth. He has collaborated with various organizations such as the Syrian Arabic Association for SOS Children’s Village, Ormina Music Institute, Amaal Organization and Solhi Al Wadi Institute – the leading music school in Syria. Currently gives solfeggio lessons at Przestrzeń Ruchu i Tańca and teaches at the Waldorf Schools in Krakow. Christina Eshak – opera singer, soprano, coloratura soprano. She studied English Literature and graduated from the High Institute of Music in Damascus. Christina was among the cast of the first opera ever staged in the Syrian capital (“The Marriage of Figaro”). She later portrayed the role of Beth in the musical “Oliver Twist.” She also appeared in “Requiem” by Mozart staged in Jordan. Like Wassim, she is a member of the Choir of the Syrian National Orchestra. She did dubbing for the Arab versions of songs for cartoons produced by Disney Channel, Aljazeera Children and Cartoon Network. Christina has collaborated with MuTha in Vienna. Currently works as Arabic teacher at the Makilen School of Foreign Languages in Krakow. She most recently starred as Belinda in the opera “Dido and Aeneas” by Henry Purcell staged by the Academy of Music in Krakow.